Dr. Jon Perlman was a member of the team of Board Certified Plastic Surgeons selected to provide plastic surgery for the Extreme Makeover (ABC TV) television show. Dr Perlman performed forty surgical procedures on 27 Extreme Makeover patients for ABC Television. By clicking on one of the circles below you can visit the individual makeover patient's page and see their photos taken before and after their makeovers. Many of the patient's pages contain videos allowing you to enjoy abbreviated versions of the television show for many of Dr. Perlman’s EXM patients. Remember that the results reflect the combined efforts of Dr. Perlman and specialists in dental restoration, hair, makeup and styling as well as that of professional trainers who worked with the patients over a 6 week (average) period of time. 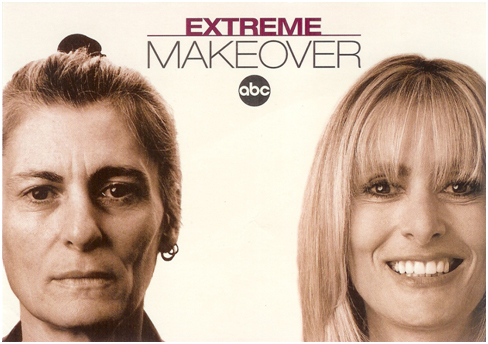 Most of the Extreme Makeover TV show patients spent 6 to 8 weeks in Los Angeles during their recovery. Sandra was highlighted in the promotional card to the right and was one of Dr. Perlman's makeover patients. Dr. Perlman was selected to provide plastic surgery for the Extreme Makeover television show. You can see videos and photos by clicking on the individual makeover patient's name below. Extreme Makeover and Beverly Hills Plastic Surgeon Dr. Perlman provides outpatient Plastic Surgery services in his Beverly Hills Plastic Surgery Center. Some of the cosmetic plastic surgery procedures include facelift, browlift, forehead lift, liposuction and body sculpting, breast implants, Beverly Hills breast augmentation, breast enlargement, breast lift, breast reduction, tummy tuck, mini tummy tuck, abdominoplasty, rhinoplasty (nose surgery), revision rhinoplasty (nasal surgery), blepharoplasty (eyelid surgery), brow lift, and more. Non surgical procedures include botox injection treatments and Juvederm Ultra filler injections.